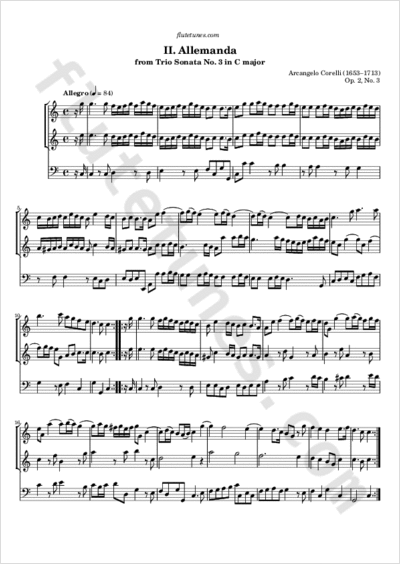 This allemanda is the second movement of Italian Baroque composer Arcangelo Corelli's Trio Sonata No. 3 in C major, published in 1685. This piece is notable because it was the origin of the “affair of the fifths”, a theoretical dispute between Corelli and other composers of the time. The cause of consternation was Corelli's alleged transgression of a rule that forbids the use of consecutive fifths in music. Some composers adhered to this rule more rigidly than others, but Corelli was particularly conspicuous in his actions. This is particularly apparent in the first four measures of this allemanda, where the first violin and bass part descend in parallel fifths. The criticism came from experienced and reputed composers (most notably, Giovanni Paolo Colonna), who despite their sound theoretical bases did not have a fraction of the success that Corelli was achieving all over Europe. In the end, Corelli's position was that, independently of theory, the condemned passage sounded good to him... and his fans agreed with him!